On August 2nd, 2011, the U.S. Consumer Product Safety Commission and Health Canada, in cooperation with Battat, Inc, announced a voluntary recall of all their B. FunKeys with remotes due to a potential choking hazard. The metal toy keys and the plastic key ring can break, posing a choking hazard. This recall includes all B. FunKeys™ with factory code H58000-01 or H26300-01, and Parents® Magazine Electronic Keys with factory code H26300-01. The factory code is located on the back of the remote. The remote of the B. Fun Keys is olive green or red and the top of the keys are multi-colored. The remote of the Parents Magazine Electronic Keys comes in different colors and the top of the keys is a solid color. Both remotes have sound buttons, and the metal keys hang from a plastic ring. 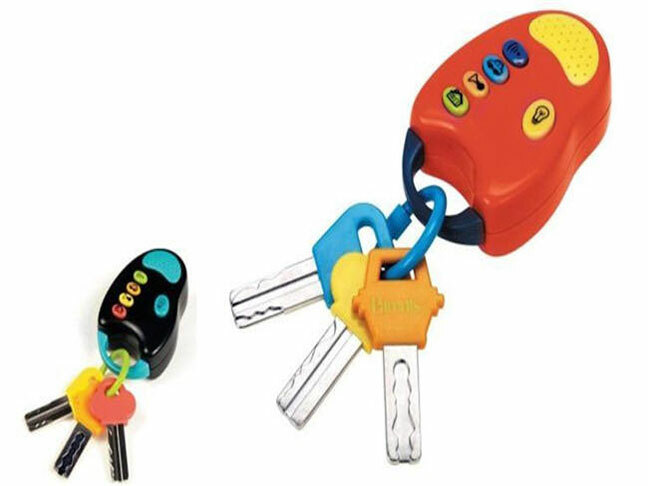 These toy keys were manufactured in China and about 1,080,000 of them were sold in the United States and 3,600 in Canada at retailers nationwide and online sellers from April 2010 to May 2011 for B. FunKeys, and from January 2006 to December 2009 for Parents Magazine keys for about $9. As of August 2nd, 2011, the CPSC and Battat have received 17 reports of keys breaking, and 14 reports of key rings breaking. No injuries have been reported up to August 2nd, 2011..
What should you do if you own any of these products? Consumers should immediately take the recalled toy keys away from children, stop all use of them and contact Battat to receive replacement keys. It is illegal to resell or attempt to resell a recalled consumer product. For additional information, contact Battat toll-free at (866) 665-5524 between 8 a.m. and 4:30 p.m. ET Monday through Friday, or visit the firm’s website. Additional general information about this recall can be found at the CPSC website and Health Canada’s press release is available here.